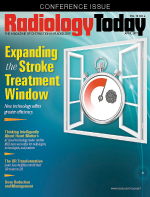 The evolution of stroke treatment continues with new-generation technology developments involving improved thrombectomy devices and new ideas about device usage. The well-known paradigm is simple in its articulation but powerful in its implication: To effect a better patient outcome, rapid medical intervention is required within the first six hours of a stroke. However, treatment has been subject to limitations, specifically with tissue plasminogen activator (tPA). These included the size of the treatment window, geographic barriers to rapid care, and problems with treatment of ischemic stroke and large vessel occlusions. Fewer than 2% of stroke patients receive the required treatment within the six-hour time window, according to the Rush University Medical Center in Chicago. Sometimes patients or family members don't know the stroke symptoms. Other patients wake up knowing they've suffered a stroke but, having slept eight hours, don't know at what time the stroke occurred. Emergency transport may be delayed because the closest medical facilities are unable to provide the most effective treatment options. Problems have loomed larger in cases of ischemic stroke, a particularly pernicious form of the disease. According to the Centers for Disease Control and Prevention, most strokes (85%) are ischemic. The usual cause is a clot that blocks a blood vessel that provides blood to the brain. The blockage causes brain tissue to die after only a few hours. This led to that terse, ominous pronouncement that "time is tissue." But hope increased and the time barrier decreased as technology improved. Once, the time window was as small as a porthole—three hours. Today, it is increasing beyond six hours to seven and even 12, and clinicians have been able to restore blood in nearly one-half of the stroke victims they have treated, decreasing the number of physical and/or speech deficits. Manufacturers addressed problematic issues by developing devices designed for intra-arterial thrombectomy and thromboaspiration. Subsequently, new thrombectomy approaches rapidly evolved. Advances in catheter technology and thrombectomy devices resulted in benefits such as higher recanalization rates. "We are seeing better outcomes with the next-generation aspiration technology, catheters, and thrombectomy devices such as stent retrievers," says Jeffrey Farkas, MD, director of interventional neuroradiology at New York University Lutheran Medical Center in Brooklyn. Two years ago, a group of neurointerventional physicians charted the recent course of advancements. The physicians' review, "Evolution of Thrombectomy Approaches and Devices for Acute Stroke: A Technical Review," appeared in the January 2015 issue of the Journal of Neurointerventional Surgery (JNIS). They describe a direction that took the field from "rudimentary mechanical disruption" into intra-arterial thrombolytic infusions and then to increasingly effective thrombectomy devices. Among the technological highlights underscored were ﬁrst-generation retrieval systems, second-generation aspiration systems, and third-generation stent retrievers. To get a sense of where stroke treatment is now, it is helpful to take a close look back at the following specific developments. Recombinant tPA (rtPA), the first proven treatment for ischemic stroke, is a medication that dissolves clots. It isn't completely effective on the larger clots, however, and that is troublesome, as large vessel occlusions can be fatal or lead to severe disablement. "Twenty years ago, clinicians were limited in their ability to open blood vessels to the brain that had been occluded by thromboemboli," says Farkas, who has worked in the field of interventional neurology since 1996. "We went inside with a catheter and injected tPA to reopen the blood flow. This extended the treatment window from three to six hours. Patients were improving, but some of them experienced complications such as intercranial hemorrhage." "The next step was removal of the clot without tPA but with thrombectomy devices," Farkas continues. Use of mechanical thrombectomy increased the window to six hours, and it reduced incidence of death and crippling disability by nearly one-half. During a procedure, clinicians make a 1-cm incision in the patient's groin area. Guided by imaging technology, a catheter is then navigated into an artery and up into the patient's neck. Finally, it reaches the stroke-causing clot. The clot is removed with suction or stent devices and pulled from the blood flow. Mechanical thrombectomy was considered a major breakthrough for interventional stroke treatment, Farkas says. "Specifically, the proximal and distal approaches proved the most effective in restoring blood flow." Treatment of acute ischemic strokes with thrombectomy devices resulted in better revascularization and improved clinical outcomes—much more than with just intravenous thrombolytics. Mechanical thrombectomy combined with systemic thrombolysis (including rtPA) came to be considered the standard of care for the treatment of acute ischemic stroke. Still, clinicians witnessed some problems. "Again there were complications, and the devices were hard to use," Farkas says. "We moved the needle but not to the point where we were seeing enough successful outcomes to satisfy us." In their JNIS review, the neurointerventionalists described significant advances in thrombectomy devices. The first device they mention is the Merci retriever, which became the first mechanical thrombectory device cleared for patient treatment by the FDA in 2004. This device, delivered in a microcatheter, engaged the "thrombus with a 'corkscrew' distal wire and suture tip deployed from within the clot, then removing the thrombus en bloc to achieve recanalization," according to the article. A major advance came in 2010: The FDA approval of the Outreach Distal Access Catheter, a device that enabled "stable access to the target vessel." This device led the way to new thrombectomy approaches, such as the development of large-bore ﬂexible catheters. Such catheters, described as a "major advancement in thrombectomy and catheter technologies," could be placed within the intracranial circulation. Stent retrievers have proven to be a breakthrough for removing life-threatening blockages of blood flow to the brain. "Stent retrievers are the next generation of thrombectomy devices, with improved ability to remove blood clots and open blood vessels," Farkas describes. "Studies assessing these devices came out two years ago and revealed an overwhelming advantage for patients receiving the thrombectomy treatment. If you get to them at the appropriate time and open them up, [the patients] walk out of the hospital." Most recently, an improved stent retriever was cleared in 2012. These newest retrievers have significantly improved the treatment of patients suffering acute ischemic stroke, and studies have demonstrated that they are far superior to tPA alone in decreasing disability from strokes. Researchers in a UCLA-led study published in the Journal of the American Medical Association (JAMA) found that the improved stent retrievers benefitted patients up to a little more than seven hours after stroke onset. Still, the earlier the treatment is applied, the better the outcomes, as earlier treatment is better for restoring blood flow and limiting damage to brain tissue. Study findings published in the April 2016 issue of Radiology indicated that blood flow restored in 2.5 hours after stroke was associated with little or no disability in 91% of participating patients. A stent retriever has been described as a "self-expanding mesh tube" or a "small metal cage." It is attached to a wire and guided through a catheter. Its internal pathway extends from the groin and up through the blood vessels to the brain. When it reaches the clot, it pushes it against the vessel wall, restoring blood flow. Then, the retriever opens and grabs the clot, which is removed from the body when the catheter is pulled out. As described in the JNIS review, when the stent retriever takes hold of the clot, it is "retrieved" into a guide catheter. After the clot is grabbed, retrieval can be accomplished by applying suction via pump or manual syringe aspiration. The distance a stent retriever travels with the clot is minimized. To reduce the distance, technique variations are used by incorporating reperfusion catheters. The next-generation family of thrombectomy devices includes stent retriever systems such as Solitaire and Trevo Pro. Typically, as the term implies, stent retrievers are stents that can be recaptured and fused to the delivery microwire, as described in the JNIS review. Stent retrievers are especially effective for patients whose body wouldn't be able to handle tPA or who wouldn't experience restored blood flow from the medication alone. A recent meta-analysis of the five recent studies on stent retrievers in the treatment of ischemic stroke confirmed that usage is associated with a significant improvement of functional independence at 90 days. This analysis was published by JAMA in January 2017, and it included a number of trials well known by their acronyms: MR CLEAN, ESCAPE, REVASCAT, SWIFT PRIME, and EXTEND-IA. These studies revealed a significantly higher (72%) likelihood of functional independence at 90 days in patients who received treatment with both tPA and stent retrievers, compared with those receiving tPA alone. Obviously, guidance provided by radiologic imaging goes hand-in-hand with these new-generation devices. If patients come in for treatment after the six-hour window has passed, clinicians can make an evaluation based on a CT scan. Such a scan provides reliable images that help interventional neurologists detect the areas of salvageable brain tissue, no matter the time. Farkas describes how imaging then comes into play during an interventional procedure; angiography equipment is used, specifically biplane angiography equipment. "We use X-ray equipment and place the patient on a floating table," Farkas says. "We have two X-rays acquired independently but simultaneously. We can see these live fluoroscopy images on a screen." To view the blood flow, the clinician injects the patient with a contrast agent. "This provides us with a bloodflow map," Farkas explains. "First, we insert the catheter into an artery in the leg and navigate it up to and through the neck. Then, we inject the contrast to observe the blood flow and see the location of the blockage or where the blood has stopped flowing. "The bloodflow map can be imaged with the large X-ray," Farkas continues. "We also see where our tools are and what we are doing with them. We're provided with two views. With one X-ray, we wouldn't see any depth, but two X-rays show us the depth. The purpose of this is to reveal, for us, the direction to move the catheter." Farkas, a 20-plus year veteran, says this is a fascinating time to be involved in the field of interventional neurology. "Beyond the most recent clinical trials, there are a number of trials currently taking place," he says. "I am looking forward to reading the results. What really matters here is what the condition of [the patients'] brain looks like when they come to an emergency setting; the time doesn't matter that much anymore. We need to give individual patients an opportunity to be evaluated for this type of new treatment. This is an exciting area that is becoming even more exciting. "I am very glad to be a part of it," Farkas adds. "It is very rewarding to be able to pull people away from the brink of disaster. We're now able to pull them back much farther than before." Technologically speaking, here is what to look for: "Every company's stent retriever technology has improved and continues improving. The next step to go along with this better technology is to educate people on how to be better at using it and get these new experts to the patients," Farkas says. The JNIS review concludes, "Device technology, selection strategies, and medical management will probably evolve in tandem, and we look forward to the continued evolution of thrombectomy approaches for acute stroke."